December 8, 2012  A radio-collared wolf, well-known to scientists and tourists, has been killed outside Yellowstone National Park. Commentator Barbara J. King points to the larger controversy of which this latest wolf death is a part. May 31, 2012  At Yellowstone National Park, the Earth growls, wolves prowl, bison roam and it's possible to go stand in a volcano's crater. 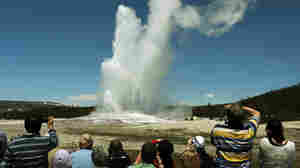 Science bursts to life in Yellowstone. So how do we we tap Yellowstone's wonders to turn kids on to science?